I'd take her over Ben. She can make passes at me any day. It's definitely a motivation for all of us, but what I really need is that ring. I want to put that ring on my finger. I want the experience. We've come too far to turn back now. This is a very unselfish group. 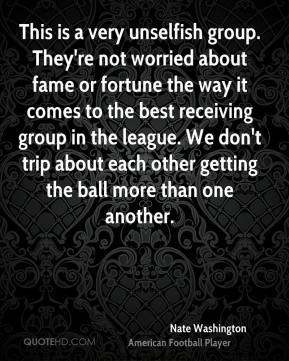 They're not worried about fame or fortune the way it comes to the best receiving group in the league. We don't trip about each other getting the ball more than one another.